When choosing athletic shoes, two features we tend to focus too much on are (1) appearance and (2)price, but neither fashion nor expense should be the chief concern when choosing footwear. Elite-brand shoes with special features often promise to help you jump higher, move faster, and look good while you’re doing it, but they’re also overpriced for their actual performance. On the other hand, buying the cheapest shoe on the market may save you a little money initially, but keep in mind you might just be replacing them in a few months because they’ve fallen apart or hurt your feet. So what’s most important when shopping for shoes you intend to exercise in? Your priority should be finding a shoe that’s (1) right for your activity, and (2) meets the needs of your feet. Everyone understands that you need special shoes for sports like football, soccer, and track, but there isn’t much clarity on proper footwear for other activities. For instance, what’s the difference between a cross-trainer, court shoe, running shoe, and walking shoe? As a multi-purpose shoe, the cross-trainer is appealing because it implies you can buy one pair for everything, but that actually depends on how heavily you’re involved in each sport. If you participate in a variety of activities on a casual basis, a cross-trainer might work fine. The down side is that cross-trainers aren’t great at any one thing. If you engage in one activity more than 3 times a week, you may find that this shoe type isn’t meeting your sport-specific needs for stability, support, or cushioning. 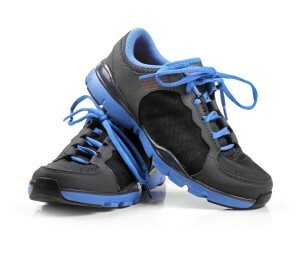 Nevertheless, if you choose a cross-trainer, you’ll want something lightweight but supportive, with a firm heel. The running shoe is designed to be flexible, and cushioned for heavier midsole/forefoot impact as opposed to heel support. A common error many athletes make is wearing running shoes for sports that require lateral (side-to-side) movement. Since they’re designed for one plane of motion, running shoes may not provide enough support during other sports, and could increase your risk of injury. The court shoe is designed for sports like tennis, basketball, volleyball – anything that requires jumping and running from side to side. The walking shoe focuses on heel cushioning and tends to be a lot stiffer than other athletic shoes. A basic self-analysis you can perform is to check the tread on an old pair of shoes. If the outside heels and inside forefeet are worn heavier, you probably have low arches and over-pronate. In this case, you’ll need a motion-control shoe that offers maximum structure and support. On the other hand, if your shoes are more worn on the outside edge of the forefoot, you may have high arches and under-pronate. The best shoes for you will have more cushioning and a softer midsole. Lastly, if your shoes wear evenly, your arches are neutral, and you’ll do well in a general stability shoe. Don’t make the mistake of thinking you’ll always wear the same size, either. Podiatrists say that the size of our feet changes throughout our lives, and recommend re-checking your size at least twice a year. There’s also no such thing as ‘breaking in’ a pair of shoes – they should be comfortable immediately, with about a thumb’s distance between your big toes and the end of the shoes. For the most accurate sizing, try on shoes after you’ve been on your feet all day to mimic the swelling that occurs during exercise. Getting the right shoes should be one of the first steps you take when starting a new fitness routine. Instead of focusing on appearance or price, choose the right shoe for your activity and foot type, and you won’t regret it.